100% certified natural. Restores mature skin. Reduces deep lines and wrinkles. Strengthens delicate skin. Fragrance free. Certified natural facial care. Free of synthetic preservatives, fragrances, colorants. 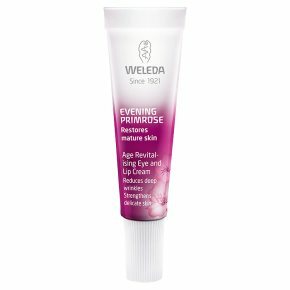 Free from mineral oil derivatives.Evening Primrose Facial Care Restores mature skin Designed for mature skin this range helps to restore and firm. It helps to strengthens skin's structure and increases skin's resilience. Evening Primrose: Helps stimulate the natural defence system and restorative processes of mature skin. Age Revitalising Eye and Lip Cream The restorative cream helps reduce deep lines and wrinkles whilst defining lip and eye contours. It reduces puffiness. The area around the eyes and lips looks smoother. Effectiveness and tolerance clinically tested. Application: Gently pat a small amount into the skin around the eye and lip area in the morning and evening.